Welcome to the new look of Transpicuous News! We will be recording regular episodes of The Transpicuous News Show on The One Network. As each episode is released, I will posts the videos and all the related material here. Last week we filmed my first episode of Transpicuous News for the One Network. This episode is focused on the "Ebola" outbreak and other "viral" issues ongoing in the world at this moment. I am putting together episode 2 with some follow up information..... soon. Note: The final 10 minutes of the show, which was an update that Lisa and I filmed the next day, has terrible sound- sorry folks! We've now learned our lesson to wait for our audio wizard to set up a proper mic instead of just using the laptop mic. We promise not to do it again ! Debut broadcast of Transpicuous News with Dani Arnold McKenny. In this episode D discusses the current Ebola ‘situation’ in West Africa. When Ebola isn’t really ebola, and EV-D68 is really Polio: Digging deep to connect the dots of medical mythology. lets look at the oil reserves in northern Africa- well would you look at that! all the countries that have “ebola” outbreaks are also known to be oil rich! So the world’s militariess are all fumbling around with no funding and severe funding cut backs. So if you have a place that you want to control, yet you don’t have the money to actually create some sort of excuse to send in your military, then you need to find another way, right? wella! a medical emergency allows you to openly send in the UN “peacekeeping” troops and the “CDC” (you know that the CDC is actually part of the US military right?) Using the CDC gives you an excuse to get funds, ‘cause you know.... it’s a medical emergency! That of course gives you an excuse to send in the military to “support” the CDC personnel under the guise of “peace keeping”, and if they just happen to take over some oil fields... well.... you know. This is actually a very important aspect to all of this “ebola” scare. There is no money, so they have to come up with other ways to do what they want. When there is no money, they have to use other means to control- ie: FEAR. and of course there is the fact that they are using the “Ebola” outbreak to project FEAR and distraction to the global population. early ebola symptoms are almost identical to malaria and typhoid fever, chikunga, and dengue fever, which in it’s severest form is called dengue hemoraggic fever. 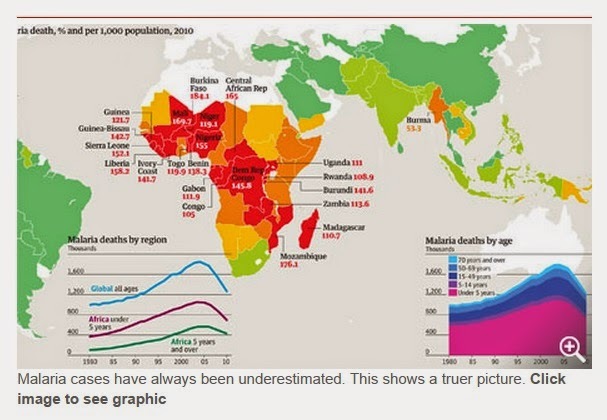 Globally, Malaria, dengue and Yellow fever account for over 1.5 MILLION deaths a year. *** after recording the first transpicuous news edition yesterday afternoon, I sat back and reviewed (as best my memory could) everything that I spoke about. I spoke “off the cuff” for the vast majority of the show and rarely looked at my notes, lol- which was probably apparent as I found myself going off on a few tangents. One of the points that I wanted to make very clear was not fully brought through, so I would like to finish that part of the conversation here. I was speaking about dengue fever and stated that I have had both dengue and malaria in the past (I’ve actually had dengue twice) and that dengue is so horrible that you actually wish you would die. This is an important point, because the mind is in complete control of the body when you are in that extreme state of sickness. If you are in the throws of dengue fever, and if a medical person tells you: “You have Ebola”... you are immediately in that mind space that you are going to die! There is no question. It is a statement of absolute. Lisa and I are recording a follow up to this point later on today, because it's importance cannot be stated strongly enough. As a side note, Tokyo has just had their first cases of dengue fever since 1945- all surrounding one park in Tokyo. ""Unlike the majority of enteroviruses that cause a clinical disease manifesting as a mild upper respiratory illness, febrile rash illness, or neurologic illness (such as aseptic meningitis and encephalitis), EV-D68 has been associated almost exclusively with respiratory disease," the Missouri health agency said." EV68 almost exclusively causes respiratory illness, and varies from mild to severe; symptoms thus include throat ache, runny nose, cough, difficulty breathing as in pneumonia up to respiratory failure. As all enteroviruses it can cause variable skin rashes, abdominal pain and soft stools. Extremely rarely it can attack the central nervous system either causing headaches, or paralysis of one or more limbs that reaches peak severity within 48 hours of onset. ....Although there is no known vaccine for the virus, and the scope which it will reach is also unknown, those that have become infected are following a common theme. They have all been vaccinated with the MMR vaccines, influenza vaccines, and polio vaccines. Of course, many children in the United States have been vaccinated, and most are required to be vaccinated in order to enter school. However, it is interesting to note that the illness is not occurring, yet, in children that have not been vaccinated. Statistics on polio were manipulated. One such way was to redefine the disease, renaming it "viral or aseptic meningitis" or "cocksackie virus". In one US county, for example, in July 1955 there were 273 cases of polio reported for 50 cases of asceptic meningitis, compared to 5 cases of polio in 1966 and 256 cases of aseptic meningitis. These new diagnostic guideline's were issued by the CDC. If you object to polio vaccination, and you get polio--it is usually called "polio." If you have been vaccinated and you get "polio", it is called meningitis(2). As we have reported, a statement released on August 27th by Dr. Thompson in response to media coverage is that he and co-authors from a 2004 article published in the journal Pediatrics did in fact omit important information from a study on the link between vaccines and autism.